Actinic keratoses are pre-cancerous lesions that develop on sun-exposed areas of skin. They most commonly appear as rough, dry and scaly patches on the skin. Actinic keratoses are warning signs that indicate that the skin has been damaged by ultraviolet (UV) radiation, and that there may be a higher risk of developing skin cancer. These spots can sometimes disappear with strict sun avoidance and regular use of sunscreen, but most persist and can become uncomfortable and unsightly. They tend to occur on areas of high sun exposure such as the face, back of hands, ears and lips. Actinic keratoses on the lips are known as actinic cheilitis. 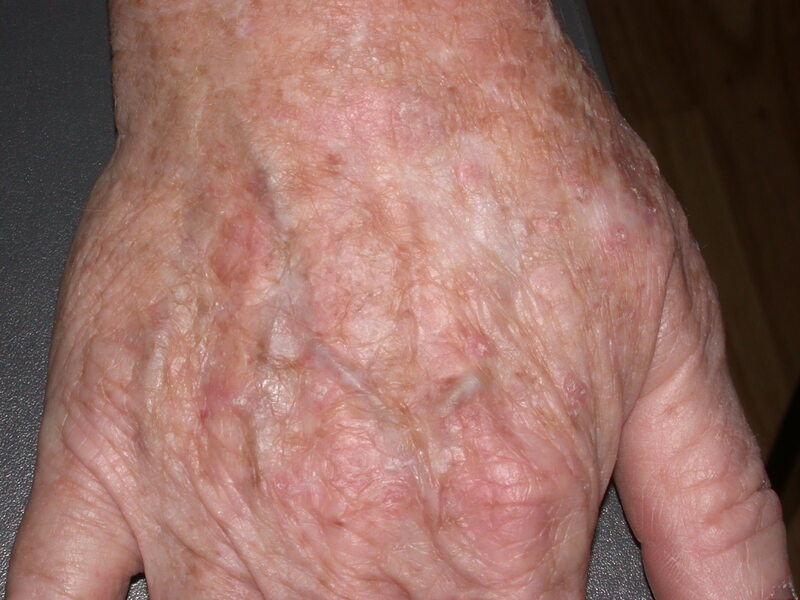 Actinic keratoses are more common in older people with fair skin, pale coloured eyes, and red or blonde hair who burn easily and do not tan well. Some actinic keratoses will develop into an invasive form of skin cancer called squamous cell carcinoma (SCC). Progression to SCC may be indicated by growth, discomfort/tenderness, and persistent ulceration or bleeding. The main cause of actinic keratoses is repeated exposure of the skin over many years to ultraviolet radiation in sunlight. UV radiation penetrates the upper layers of the skin and can produce changes to its structure and appearance. Repeated UV exposure can also damage some of the genetic material (DNA) in skin cells causing chemical changes and mutations. It also impairs the skin’s immune system and its ability to repair any damage. What do actinic keratoses look like? Actinic keratoses are commonly found on areas of the body that are regularly exposed to the sun (face, neck, scalp, forearms, backs of hands and lower legs). Early actinic keratoses may be more easily detected by feel, as rough sandpaper-like patches on the skin. The appearance of actinic keratoses can vary, even in the same person. 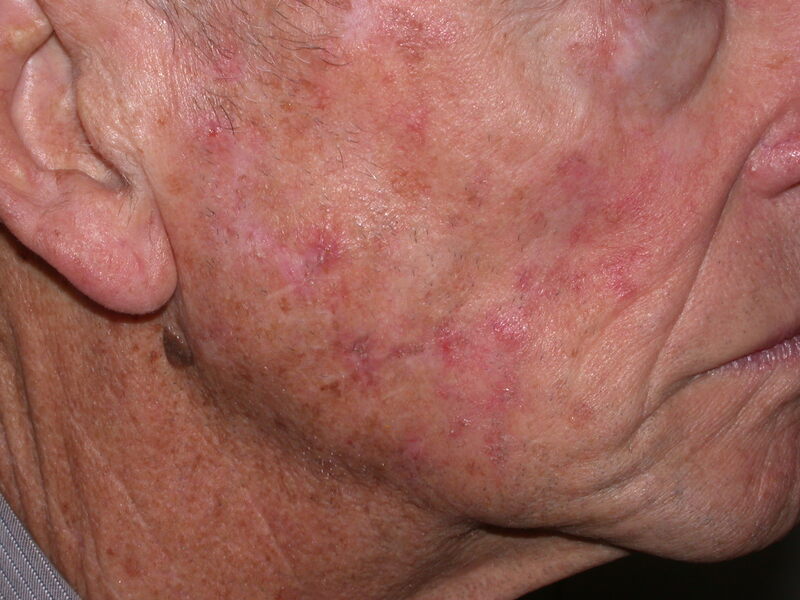 They can occur as single, isolated lesions or, more commonly, as multiple scattered scaly patches. Actinic keratoses can vary in size from less than 1 mm to over 2 cm. They often appear as a flat or slightly raised scaly patch which can be pale, red or brown in colour. Sometimes they can develop as a thickened or wart-like area, or a small horny outgrowth. Actinic keratoses are usually symptomless but can be itchy or sensitive to touch, or give a prickling, burning or stinging feeling when exposed to sun or perspiration. What other problems can occur with actinic keratoses? Actinic keratoses are associated with an increased risk of developing skin cancers, particularly an invasive form of skin cancer called squamous cell carcinoma (SCC). Although the risk of developing this cancer is low (about 1 in 1000), the risk increases as the number of actinic keratoses rises. Given this higher risk, people with multiple actinic keratoses should visit their doctor for a skin check. A referral to a specialist dermatologist may be necessary. How are actinic keratoses diagnosed? Actinic keratoses are usually diagnosed from their physical appearance. However, in cases of doubt, or if progression to SCC is suspected, a sample or skin biopsy may be taken under local anaesthetic for examination under the microscope. How are actinic keratoses treated? There are many options available for treating actinic keratoses. The main aim of treatment is to prevent the lesions from turning into skin cancers as well as improving the appearance and texture of the skin. Cost and availability of treatment. Surgical excision: This is usually only used when it is difficult to tell if the lesion is an actinic keratoses or an early skin cancer. Keratolytics such as salicylic acid or retinoids (vitamin A) creams may be used to help improve skin that has been sun damaged. It is not uncommon for the lesions to recur which is why repeat treatment is sometimes necessary with any of the above options. What is the likely outcome of actinic keratoses? The presence of actinic keratoses is a sign that the sun has already damaged the skin. However, sun damage is cumulative which is why it is important to continue to protect the skin from the sun to minimise the risk of developing new actinic keratoses and possible skin cancers. If treated early, actinic keratoses can be cured. 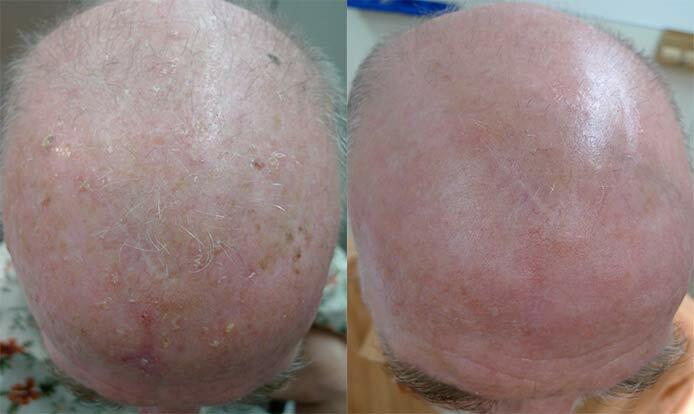 Very early actinic keratoses can sometimes regress or disappear with regular sun protection. Regular sunscreen use and sun protection has been shown to reduce the risk of developing new actinic keratoses. 2018 © Australasian College of Dermatologists. You may use for personal use only. Please refer to our disclaimer. Take five minutes to complete a short survey about A to Z of Skin. 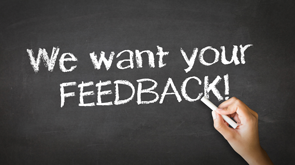 Your feedback will be used to help us improve the site.